Most of my laptops (we have several in the house) have 256GB or 480GB SSDs in them, but I am still operating a desktop (affectionately known as “BigBertha”) that functions as a general use computer and backup station. It runs a pair of mirrored 750GB Seagate NS drives along with a couple of front access bays in which we can plug in various other drives for backup purposes. BigBertha is home-built Windows 7 computer running an ASUS P5Q-EM motherboard with 4GB of memory. 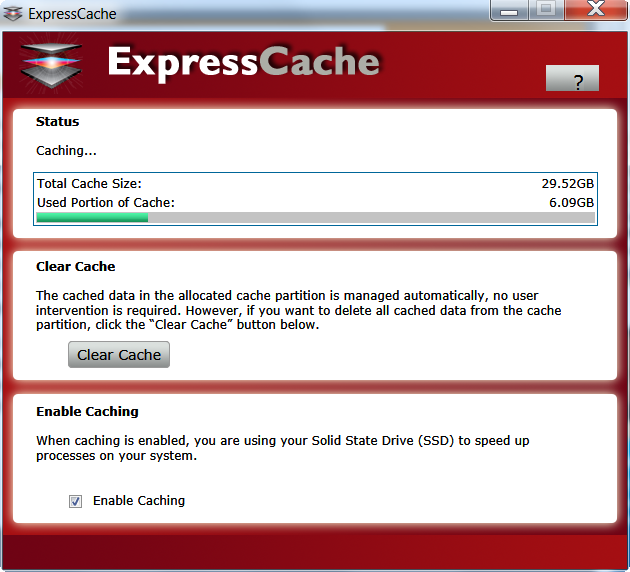 I was in Microcenter and was looking at their selection of SSDs when I ran across this SanDisk ReadyCache device. I went home and did some research and found a good article on HardOCP, read some posts on Tom’s Hardware and read some reviews on Amazon. Most of the reviews were favorable, so I thought I’d invest the $40 (one of the few things at Microcenter that appears to be a good price) and see what happens. The hardware installation was pretty straightforward. It is a 2.5” drive sized device that comes with an aluminum bracket to extend it to 3.5” for inside a desktop. All the screws (8) are provided, as well as a SATA cable. However, you’ll need to make sure you have an available SATA power cable and perhaps a Y power adapter (I had to go up to my supply in the attic and find one) to supply power to the device. The software requires an activation key, which is provided on the software instruction sheet (I’m assuming it is a generic key, since it was not “after printed” on anything). It’s on the back, right under the Turkish translation of the s/w installation instructions. Obvious, eh? You have to pay attention! I’m running an Intel disk mirror on C:, and at the time I started I didn’t notice my mirror needed to be rebuilt, so my first attempt at getting it running wasn’t successful. However, after rebuilding the mirror (overnight) I was successful. 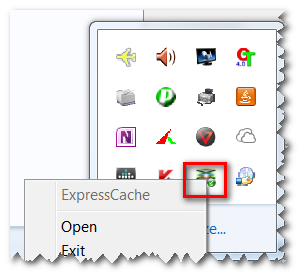 If you are looking for the ExpressCache GUI, you’ll find it in your Programs under Condusiv Technologies. The GUI can minimize to your tray where you can easily right-click it and open it to view your stats, or to clear the cache. The device (which is essentially an SSD) shows up as a disk volume. I had to go into Disk Management a couple of times and delete the volume, because when you initially install, it seems there can be some timing issues between windows identifying the drive and installing device drivers and ExpressCache being able to “see” and use the drive. However, after a couple of times, all was good. 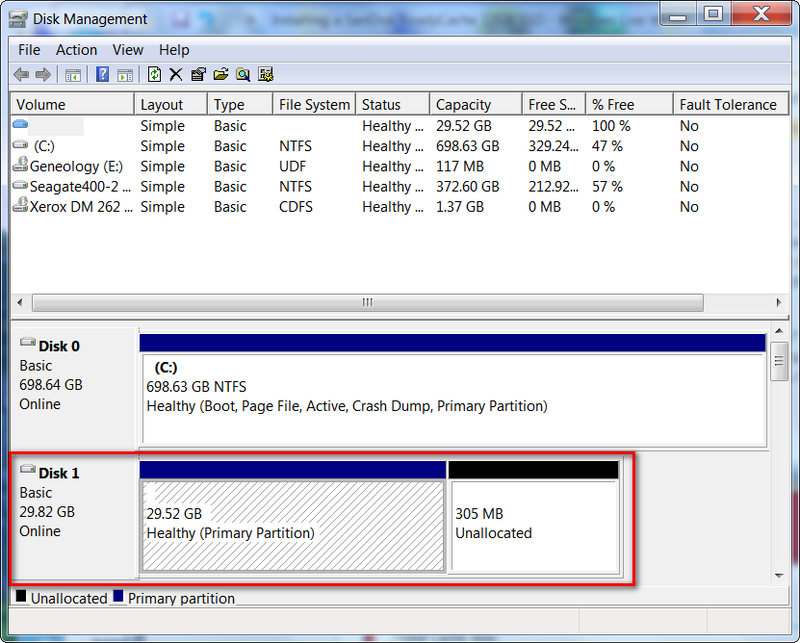 Here’s what it looks like in Disk Management (diskmgmt.msc). I have to say, after starting some apps a couple of times, the response is extremely noticeable. In fact, this might be as good or better than a hybrid drive. For example, Outlook loads as fast as on my machines with a full SSD and other Office apps “pop” almost instantaneously. From a boot up perspective, the time to get to a login prompt from when Windows starts to load went from 38-40 seconds to around 20 seconds. After entering a password, the time to be able to “use” the computer (after all my crap loads) went from 70+ seconds to about 30 seconds. I acknowledge this as a great success! Best $40 I’ve invested all week. This entry was posted on February 17, 2013 at 3:25 pm	and is filed under Computer Repair, Instructions. You can follow any responses to this entry through the RSS 2.0 feed. You can leave a response, or trackback from your own site.